AT LAST it's over - well, as long as ASADA decides not to charge Essendon players over the club's supplements program anyway. The biggest scandal in the history of the VFL/AFL has seemingly come to an end with the biggest punishment ever dished out by the league. 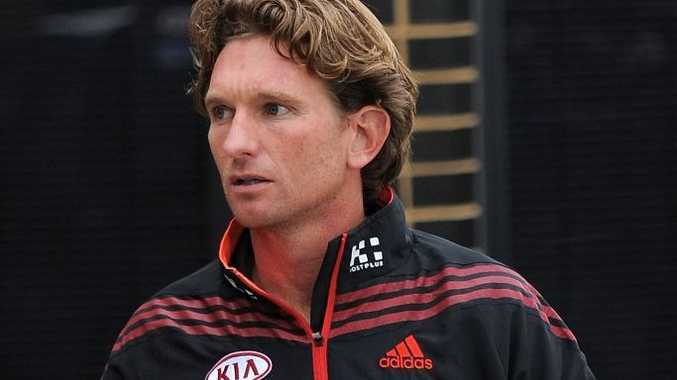 Finally, we won't have to be subjected to any more shots James Hird, usually decked out in his Essendon tracksuit, getting into his car out the front of his Toorak mansion. While I felt for the great man as he had to confront the media throng camped out on his doorstep every morning, the fact he was emerging from a $4.8 million property lessened the sympathy levels just a fraction. Hird bought the house with wife Tania when he was at the peak of his powers as a player way back in 1998. Ironically, it is within "easy walking distance" of homes owned by AFL chief executive Andrew Demetriou and former Telstra boss Ziggy Switkowski, whose own review of the club's practices was damning enough without ASADA's interim report. I doubt the Hirds will be having either over for dinner anytime soon, though the Bombers coach will have plenty of time for hosting dinner parties over the next 12 months while he sits out his ban. Along with assistant coach Mark Thompson, who was fined $30,000, and football manager Danny Corcoran, who was suspended for six months, Hird did the right thing this week and took his medicine, so to speak, for "poor governance". The club's head doctor for the past three decades, Bruce Reid was contesting charges yesterday, but although he had been strong in his belief that "we should be winning flags by keeping a drug-free culture", as he wrote in THAT letter, he should have done more to nip the whole thing in the bud. Tuesday's events completed the stunning fall from grace of the joint 1996 Brownlow Medallists. As Brisbane coach, Michael Voss wanted to inject experience such as Brendan Fevola into the Lions' line-up. As Essendon coach, Hird wanted to inject, well, who really knows what, into his players. But, he will be back in charge of the Bombers for the 2015 season, and good luck to him. Thompson, a two-time premiership coach with Geelong, meanwhile, is expected to take the reins in 2014 and although the Bombers will not take any part in this year's finals, they may still be well placed to contest them next season. Although Essendon was desperate to avoid losing both its selections in the first two rounds of the next two national drafts, as part of the club's severe but warranted punishment, the club would appear likely to work to get them back. They are in the fortunate position of having players such as in-demand key forwards Stewart Crameri and Scott Gumbleton, ruckman Tom Bellchambers and livewire small Leroy Jetta who could be used as bargaining chips at the trade table in October. While the 56 points the Bomber have accumulated this season will ultimately count for nothing, the club should now be focused on its 56,000 members and reimbursing them for a lost season, perhaps in the form of a discount for 2014. I also like the idea of the $2 million the club has been fined by the AFL not going into league coffers. It's not quite enough to buy a property in Toorak, but would be a big help to any charity - possibly even medical research into the long-term health effects for the players injected by Stephen Dank, as has been mooted. Hird sent out as a winner?